We went to the New Britain Museum of Modern Art today. I love the illustration collection, which had changed since we were there last time. (Maybe last year?) We went to see the exhibit on the artist colony at Provincetown, Massachusetts. I left feeling that I want to work en plein air. So I think I'll take The Fletcher Farm Body outside when I do the revision. Also, the Provincetown art colony seemed to be strong on representational and, later, abstract art. The Lyme Colony was about American Impressionism. I wonder now if writers' colonies/conferences concentrate on some kind of specific "schools" of writing. Yaddo? The Bread Loaf Writers' Conference? The MacDowell Colony? I just heard on Facebook that Jack D. Ferraiolo, author of The Big Splash, will be at this year's Connecticut Children's Book Fair in November. By the way, while I'm a noir fan and was very fond of The Big Splash, I've wondered if kids would get it and noir in general. Did you have to be aware of the genre to get children's noir? Well, my twelve-year-old niece didn't. I got her a copy of The Big Splash a couple of months ago, and she did like it. When I told her I'd been concerned that you had to be familiar with Raymond Chandler's work to like Splash, she said, "Raymond Who?" This month's Carnival of Children's Literature can be found at Emmy's Book of the Day. And guess what? I pulled myself together and got a submission in on time. We hear a lot of talk about the importance of teachers reading to their students, but quite honestly I can only recall two books that were read by a teacher in class when I was a child. One was The Incredible Journey by Sheila Burnford. I thought of that book last night and again this morning when hearing and reading that the imaginary mountain lion killed by a car here in Connecticut had migrated from South Dakota. I say imaginary because there had been mountain lion sightings here for a while, but state officials insisted they were mistakes because mountain lions don't live here anymore. I think they must have left because of the poor business climate. Then someone hit one with a car and, wow, someone else thought to check the cat's DNA and found it, indeed, wasn't a preppy but a western creature. The mountain lion is believed to have hoofed it here all the way from the Black Hills of South Dakota, just like the animals in The Incredible Journey hoofed it wherever they hoofed it. So now I'm thinking that there might be a children's book idea in the mountain lion's story. Because, you know, the irony of it coming all this way only to be killed in a random accident is huge and has all kinds of narrative possibilities. The other book I remember a teacher reading in class is Justin Morgan Had A Horse by the queen of horse books, Marguerite Henry. (She was the queen of horse books and a two-time Newbery honor winner.) Now I'm waiting for stray horse sightings here in the land of steady habits. Author Laurel Snyder is planning to do 100 Skype Visits in 100 Days. That doesn't sound like a big deal because she won't have to leave her home to do it. However, that's a lot of human contact. One hundred human contacts, in fact. I can feel myself getting a little trembly just thinking about someone else doing it. Teachers and media specialists should check out her post on the subject because she's planning to do this for...free. Yes, all that anxiety-inducing human contact for free. Meriden, Connecticut has renamed its children's library The Tomie dePaola Children's Library. dePaola grew up in Meriden and has maintained a connection with his home city. The most recent issue of The Horn Book includes dePaola's acceptance speech for the Laura Ingalls Wilder Award. In it he talks about his youth in Meriden where he was interested in tap dancing and acting as well as art, and he describes the encouragement he received from adults. dePaola is also a supporter of the Northeast Children's Literature Collection. While "show, don't tell" is probably a cliche of writing, it is a true one. Tell, tell, tell, blah, blah, blah puts most readers to sleep. It has something to do with statics vs. dynamics, something I've been thinking about regarding writing. Showing is much more dynamic, while telling is more static. Geoff Herbach did a guest post at Fiction Notes called Replace Abstractions with Concrete Detail in which he talks about how abstractions often lead to "telling" in writing, which concrete details "show." It sounds pretty simple, and simple is a good thing. Here at Original Content I do what I call reader reponses to books I've read. I don't do book reviews for two reasons. In the first place, I want to stay away from the whole "negative" and "positive" review turmoil that erupts on the Internet every now and then, especially within the kidlitosphere. Focusing only on positive reviews is bad for literary discourse and bad for writers whose books are somewhere between a glowing reviewing and a warning. On the other hand, when everything is wonderful, does wonderful mean anything? In the second place, I don't actually know how to write a book review or what should be included. So I merely respond to what I read so I don't have to worry about meeting some kind of definition of what a review should be because I'm not reviewing. If I were reviewing, How Not To Write a Book Review by Robert Pinsky would definitely be of assistance. If you don't want to read about snarky, nineteenth century reviewers, skip to the end where you'll see the three rules Pinsky says every review should follow. I could have sworn that sometime this past week I also saw something children's literature related regarding reviewing, but there's no finding it now. I recently saw posts at Cynsations by Tommy Greenwald and Dawn Metcalf. Then I opened my local city paper last night and saw that Tommy will be at R.J. Julia Booksellers in Madison, Connecticut next Wednesday at 4, and Dawn will be at the Kent Memorial Library in (surprise) Kent, Connecticut next Tuesday at 1:30. On Saturday, July 30th, she'll be at the Collins Creamery in Enfield, Connecticut for an ice cream event and book signing. Once again, I'm sort of ashamed for not thinking of creative things like that to do for my books. Maybe if things work out for The Fletcher Farm Body I can make some appearances at, say, historical societies or...or...Wait. I have to think of some place with food. I know! Muffins! Muffins figure into the story! The Boy Who Lived Forever in Time. I wish I'd known about Bible fan fiction back when I was teaching Sunday school. Thanks to A Chair, a Fireplace & A Tea Cozy for the link. Drunk Tweets at Finding Wonderland. Dust City, by Robert Paul Weston is amazingly inventive. It's also what I like to call a well-balanced book. The elements of fiction are all of equal value--character, setting, plot, point of view, theme. It's not unusual for setting to get too much attention in a fantasy story, but not here. How inventive is this thing? I can't even imagine how the author came up with the basic premise. Well, actually, I can imagine it because I've now read an article in the National Post that explains some of it. But the very most basic beginning step--that the Big Bad Wolf offed Red Riding Hood and her grandma while on, essentially, drugs--Well, there's a thought a writer can run with, and Weston does. Weston takes his world of hominids and animalia--here a kingdom of animals that has evolved so that they can stand upright and speak and function in human-like ways, even to the point of attending institutions like St. Remus Home for Wayward Youth--and joins it with a noirish story of a son trying to assist his criminal father. Fairy dust has a part in the story, and my faithful readers are aware of how much I hate fairies. But the beauty of Dust City is that the fairies are kept offstage, which is right where I like them to be. I would say that Dust City is also elegantly written, even literary, because what is happening with our protagonist, Henry Whelp, in terms of what kind of wolf he could end up being is as important as the plot about whether or not there is dangerous fairy dust and, if so, where is it coming from? It's a sophisticated book for sophisticated teen readers who remember their fairy tales. Oh, and here's a terrific marketing point about Dust City. On the back cover there are no blurbs. Instead, you see in big print "WHEN YOUR DAD IS THE WOLF WHO KILLED LITTLE RED RIDING HOOD LIFE IS NO FAIRYTALE." I don't know about anyone else, but that's a much bigger draw for me than a quote from some writer I may or may not have heard of saying, "Loved it!" Dust City was a 2010 YA Edgar nominee. Errors in published book has been discussed at listservs for a few years now. The Price of Typos in The New York Times explains why copy editing ain't what it used to be. I would like to suggest that librarians shelving Advanced Readers' Copies helps promote acceptance of typos and incomplete copy editing. Errors are supposed to exist in Advanced Readers' Copies. They're bound early galleys sent out prior to publicaton for review and inspection by groups making purchasing decision. When librarians add them to their collections because they got them for free at some conference (as I know happens), they are intentionally treating incomplete books as the real thing. It's only a small point in a larger issue, but it does create a tolerance for error among readers. Going through the old e-mails on my two (I used to belong to four or more) listservs was exhausting and nowhere near as pleasurable as I thought it would be. And I still have more to go in of them. What slowed me down is that I held on to a lot of these things because I needed to check out links that were included in many of the messages for one reason or another. What's left in the second listserv isn't like that, so I should be able to go faster. I think in the future I'm just going to have to make snap decisions and delete stuff right away. I'm getting the feeling from a listserv discussion I just read that that's what a lot of people do. It must be the only way to stay out from under the load. I've worked two days on office-related details and the room still looks like a hurricane hit it because most of the work has been weeding through things on the hard drive. I'm going out for a glass of wine soon. I need it. I just found an e-mail from early December (of last year, at least, and not earlier) about a publication called Talking Writing. I don't have a prayer of ever being able to read this thing regularly, or maybe even at all, just as I don't have a prayer of reading some other on-line and traditional publications I come upon these days. What I've started doing is Liking their Facebook pages. These are professional pages, not personal ones, so there's no friending and interacting with them, which suits me just fine. As if I have time to be friends with a magazine. But what these publications do through their Facebook pages is post now and then with links to some of their recent articles. At least I'm seeing that much, and if there's something that interests me I might be able to make a few minutes to at least skim it. Oh, my goodness. It's two in the afternoon. I need to eat. One of the many, many little things I'm doing this week is tidying up my blog roll. I just took a look at Author School Visits By State, which I have listed under Lit Blogs. This isn't a blog I visit much because I'm not in the market for an author to visit my school, myself, I'm an author who visits schools. It seems to me that this site has improved in appearance and professionalism a lot since I first connected with it years ago. Do I recall a map of the U.S. with a few authors listed here and there? If so, the map is gone, and instead there's a nice little author blog. Also, the number of authors connected with the site has increased dramatically. The whole thing is maintained by children's author Kim Norman. I heard through one of my favorite bookstores that Elise Broach has a new book out, Missing on Superstition Mountain. Now, I heard Elise Broach speak a little over a year ago, so the next time I went to the library, I picked up one of her earlier books, Shakespeare's Secret. And that, folks, is one of the wonders of marketing. No purchase was actually made, but a promotional e-mail led me to mention Elise Broach's new book to all of you, and one of her older ones, as well. Shakespeare's Secret involves a young girl trying to find a jewel that appears to have belonged to a long-dead queen of England and been passed down to a contemporary person through a family member with connections to Shakespeare. Personally, I felt the various plot threads didn't tie together very well. However, I definitely liked the historical aspects of the book, which is why I was so very vague about describing them just now. I didn't want to give away the best stuff. 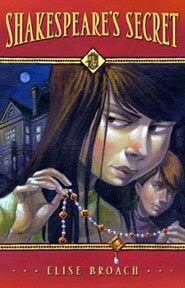 There are two big difficulties when writing mystery for children, and I think Broach does manage both of them here. The first difficulty is that kids are kids and can't go far or do much on their own. Thus it's hard for them to investigate things. That problem is addressed in Shakespeare's Secret by making the mystery very close to home. The second difficulty is that in the twenty-first century we expect parents to keep an eye on their kids and not let them wander off investigating things. That's why in so many child mysteries, the parents are distracted by work, a bad marriage, or finanical woes. The kids suffer from benign neglect and are thus able to go off sleuthing. Branch handles that issue, again, by keeping the action close to home. Another thing she does is give the child some traditional child problems--new kid in school and trouble making friends. In The Fletcher Farm Body I didn't actually give the main character a child problem, but there is something youthful going on with him and his friends. By the way, my library still stamps books with due dates so readers can tell how often a book has been taken from the library. Shakespeare's Secret has been stamped a lot. At 5:02 this afternoon, I finished the last few sentences of the first entire draft of The Fletcher Farm Body. Many chapters don't have titles, and there's a long list of items I want to address in the next draft stuck into the beginning of Chapter One. But there is some kind of entire story completed, and now I can take a few weeks off to let it all rest while I work on other small projects. The Fletcher Farm Body began on January 1, 2009 as the 365 Story Project. If you read that post, you'll see that I actually began working on it in 2008. I believe I was keeping a handwritten journal type of thing with the first drafts of the stories-a-day I originally saw this thing being. I actually began talking about that project back in December, 2005. But let's say that I've only been working on it for real since January 1, 2009. That's a little over two and a half years. In those two and a half years, I finished another book (somewhere, somehow) and spent a great deal of time submitting it to publishers and agents. I made six professional appearances (yes, I know, that's pathetic for two and a half years) that involved various amounts of preparation, and I attended seven literary events of one kind or another. I wrote and published one essay. I updated the website (though not recently), continued my flash nonfiction here at the blog, and joined Facebook. I was also in a hospital emergency room at least three times with one family member and once with another. I made untold numbers of holiday meals and transported them to one family member's home. I had two family members in different nursing homes the same year, though not at the same time. The same two family members were hospitalized the same year, but not the same time. One family member had a knee injury with a two month wait for surgery, follow-up visits to the surgeon, trips to a podiatrist, and then cataract surgery twice. I planned both a funeral luncheon and a rehearsal dinner and attended same. We had two weddings. We have a relative in another part of the country dealing with work disabities who requires a lot of support. Since the fall of 2009, I've only been working three days a week, if that, because of the older family members who need support. While I believe very strongly that in this life you'd best put one foot in front of the other and just do what you have to do, I can't say that I'm particularly good at it. I am easily distracted. It doesn't take a lot to overwhelm me. I hope I keep the griping to a minimum, but there's often a low-level hum in the back of my head that is my internal whimper. I do not define grace under pressure. I am ashamed that I can't cope better than I do when I know that there are people, like my friend Tom, who have sick, elderly family members living with them. My biggest asset in life is perseverance. The fact that I slogged through to the end of this manuscript, no matter what its quality, is all about perseverance. Here is an analogy: I have been a martial arts student for nine years. In that time, a large percentage of the adult students I've encountered were younger, stronger, faster, and more flexible than I am. But here's the thing...they left. I stayed. And that's why I'm a third dan black belt, and they're not. I gritted my teeth and stuck with it. That's pretty much how I wrote this manuscript. I gritted my teeth. So finishing this freaking thing has great significance for me. On the other hand, though, it has no significance at all because I don't have a publisher lined up. I don't even have an editor I've been working with recently who knows I've been writing this thing and is interested in looking at it. I have nothing but the incredible relief I feel at having reached a milestone. Hey, but that's good. For the next couple of weeks, I'm going to be happy. Now I am paragraphs...maybe pages, so a number of paragraphs...from the end. I must meditate a bit on this over the next day or so, because the trick is going to be to maintain the main character's voice while doing a mystery reveal that isn't too much of a eulogy. I am going to go fold some clothes and wait for a breakout experience. I am a shortish chapter and some pages from being done with the firstish draft of the never-ending work in progress. (I say firstish because the first four or five chapters have already been through...ah...eight drafts.) I plan to let the thing sit for a few weeks before working on it again, during which time I will do some other things. If I can finish it before Monday, one of the other things I'd like to do is attend this booky luncheon. So I'll be working for a bit this evening. This explains why you're not getting a more compelling blog post. Or maybe the two go hand in hand. I'll get back to you on that. Check out Figuring Out Theme at Routines for Writers in which a writer/blogger struggles with theme. For what it's worth, I've heard that some (many?) writers aren't aware of theme until after they finished a work. That is definitely the case with me and my early books. I think now that that's probaby a mistake, particularly for children's/YA writers. There are specific themes that help make a book a children's book rather than, say, an adult book that simply has a child main character. Therefore, I think those of us who are truly setting out to write children's books should be working with them. NOTE: I am posting less because of your more positive family events--weddings and holiday weekends. Plus this year I'm reading a lot of Terry Pratchett's adult books, giving me less reading to post about. I have a little less material. Because I don't write paranormal romance or even paranormal novels and don't read widely in those genres, I'm not knowledgable enough to address the question of a Buffy Factor in YA literature. I do think Buffy, herself, was a high point in television as far as powerful younger women are concerned. I don't see how anyone who was a follower/fan of that show can read the Twilight series and not be uncomfortable with Bella's passivity and child-like dependence on a man. I sometimes thought of Buffy while reading those books. Hmmm. So while I don't know if there are any BTVS parallels in YA literature right now, I guess I'd have to say the show had an impact on me as a reader. I want some strength in the female protagonists I'm reading about.